Regimental funerals, whether for police or military personnel, are always moving experiences. 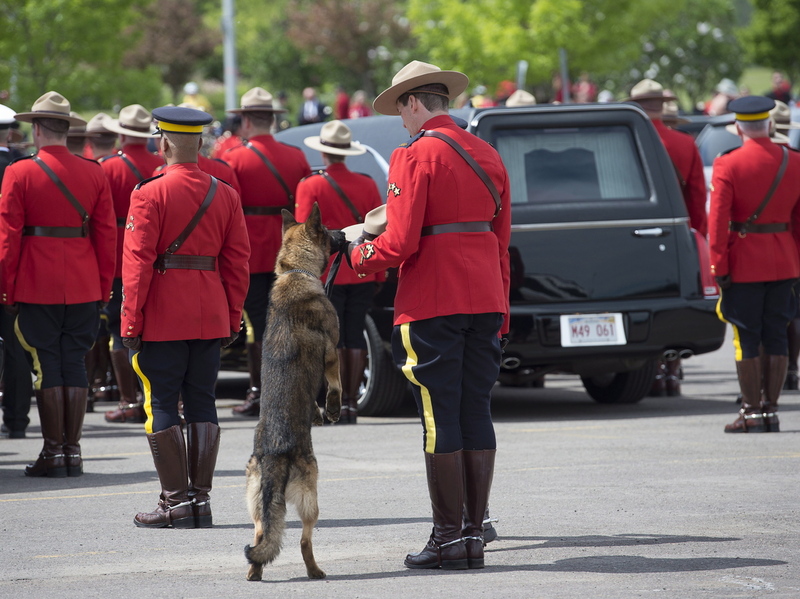 But one of the most heart-rending images from the funeral for the three officers of the Royal Canadian Mounted Police, held in Moncton, New Brunswick, last Tuesday, was that of a dog. Constable Dave Ross, one of the fallen, served in the canine unit. His shift partner was a dog named Danny. Ross left behind a pregnant wife and a toddler, and we can only imagine the unspeakable grief that they – and the families of all three deceased officers – have felt and continue to feel. But we can, at least, imagine it. With an animal, we can’t imagine its grief, because we don’t think like animals. Danny could not shed tears at the funeral. All he could do was express what he did best: loyalty. He audibly whined through parts of the service. He wanted to be near his partner, even to the point of standing on his hind legs during a procession to get one final whiff of his handler’s scent from Ross’ hat, a lasting reminder of the one he went work with, the one with whom he served and protected. I think it was Mark Twain, the famous American writer, who said that his goal in life was to be the kind of person his dog thought he was. There is some wisdom in that, for dogs tend to find the best in their owners. And those owners are rewarded with loyalty and faithfulness. There are those who think that the God of the Old Testament bears little resemblance to the God of the New Testament, but, in truth, they bear witness to the same God. There is a word in Hebrew, the original language of the Old Testament, that is found in many places from Genesis to Malachi. Many translators render it to say, simply, ‘love’. However, it is deeper than that. The word translates well to ‘covenant faithfulness’ – in short, the kind of love expressed by Danny the Canine Mountie. God’s expression of love toward his people has always been, and will always be, love – covenant faithfulness. So maybe becoming the kind of person your dog thinks you are isn’t quite as high an aspiration as becoming like your dog, being loyal, loving and faithful to God, and to others, to the very end. “The faithful love of the Lord never ends! His mercies never cease. Great is his faithfulness; his mercies begin afresh each morning” (Lamentations 3.22-23, NLT).